Wow, that card is stunning! That is some major scissor work. This is so COOL Kazan!!! 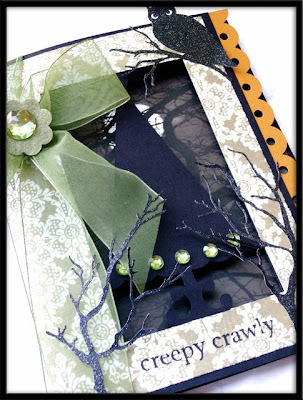 I never thought of making a Halloween card with this cut...yours is wonderful!!! I sure hope you're not getting what Laura has!!! Feel better soon!!! HUGS!!! I absolutely love this! What a creative idea. LOVE LOVE LOVE Halloween too! omg--how GORGEOUS is this?!! (hint: it is so very gorgeous, i am tempted to make halloween cards...which i NEVER do!!!) :) wow! Gorgeous card, girl. Too bad we don't have Halloween over here. Amazing looking card! Love it! Lovely!!! I really love your cards! Can´t stop going through your blog! Thanks for the nice comment on my card!